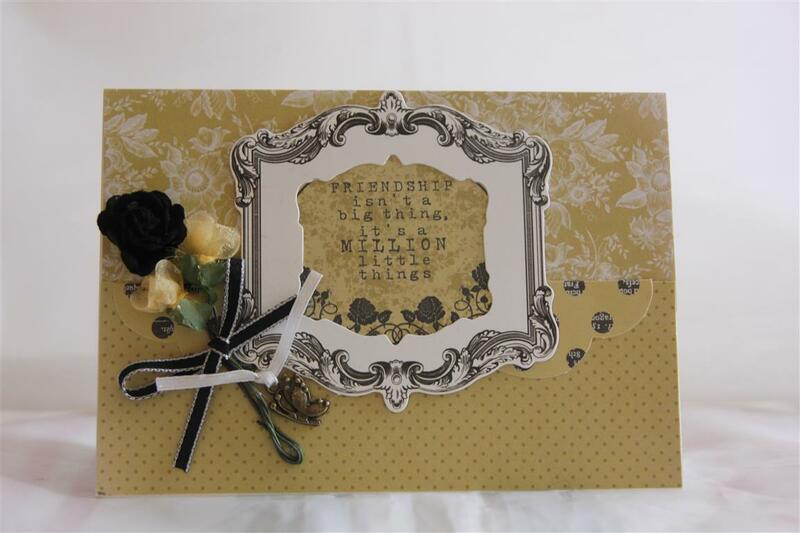 Here is my last ( I promise…maybe) Kaisercraft Ooh La La card. 17 cards with this paper!This one is the easiest one yet.A piece of 12 x 12 cut apart paper with a bow made from some of the 6″ pad paper. The bow was done with my Stampin Up bow punch. Most of the cards in this series were made when I had injured my shoulder and couldn’t use my die cutting machine,so I really relied on the papers, it was an interesting exercise. Tomorrow i start my new job at Paper Flourish. So looking forward to it, I can’t wait, surrounded by temptation all day!But for today, it’s grocery shopping and quite a hot day so a quiet day inside. 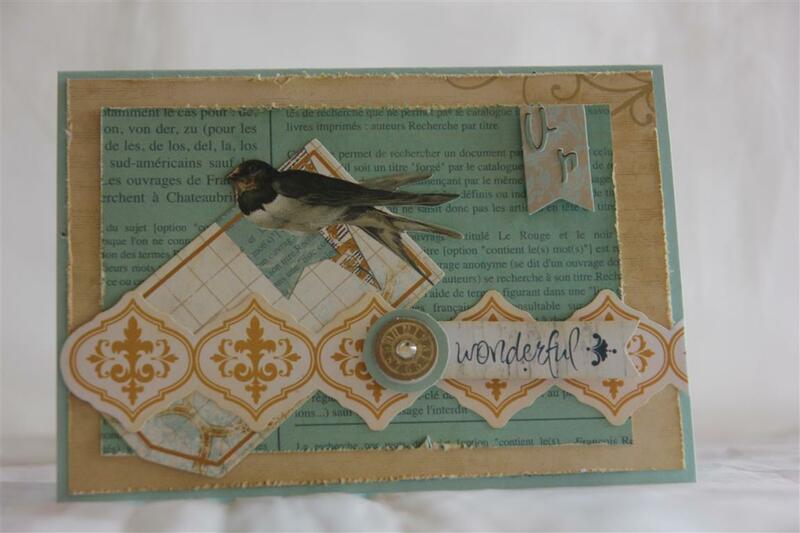 Til tomorrow…..
Kaisercraft Ooh La La 14…. It appears we are back to some Kaisercraft Ooh La La makes!I drew out a tea cup template and cut it out of some of the patterned paper from the 6″ pad,and decorated with orange ric-rac,ribbon, Green Tara flowers lace and a collectable butterfly from the matching set.The sentiment was from the 6″ pad, and I mounted it on some blue cardstock. Things are back to normal here, all unpacking and washing done, caught up with Mum and Dad, inspected the garden, and today I am looking forward to sitting in the craft room after nearly 2 weeks away from it! Til tomorrow…. A totally different card today compared to yesterdays clean and simple design! 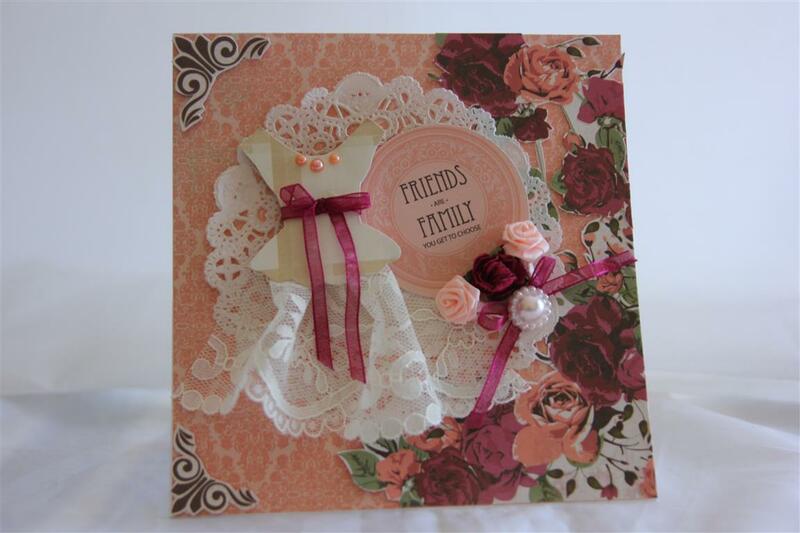 This is a card I made for our card club.The background paper is from the Kaisercraft Lady Rose 6″ pad, and I fussy cut all the flowers around the edges from another sheet from the same pad. I lightly inked the doily and added some of the matching collectables. I drew the bodice ( the paper there is a scrap of websters pages) added some lace for the skirt, and them embellished with flowers,pearls and ribbon. I had great fun creating this one – didn’t think too much about it – just cut and stuck! I have a couple of orders to do this weekend,then lots of new kaisercraft papert to play with – can’t wait!til tomorrow…..
Bo Bunny – The Avenues…. this one had me stumped- I had to go through all my paper collections to find the name! I have only done a couple of cards with it so that’s why it didn’t come to mind… anyway it is Bo Bunny The Avenues, and the bits and pieces on the card front are from the matching noteworthy collection. I distressed all the edges, and I have left it out on my table to do some more with it this evening. I have been working on xmas most of the day so will welcome a little break tonight! Til tomorrow…. 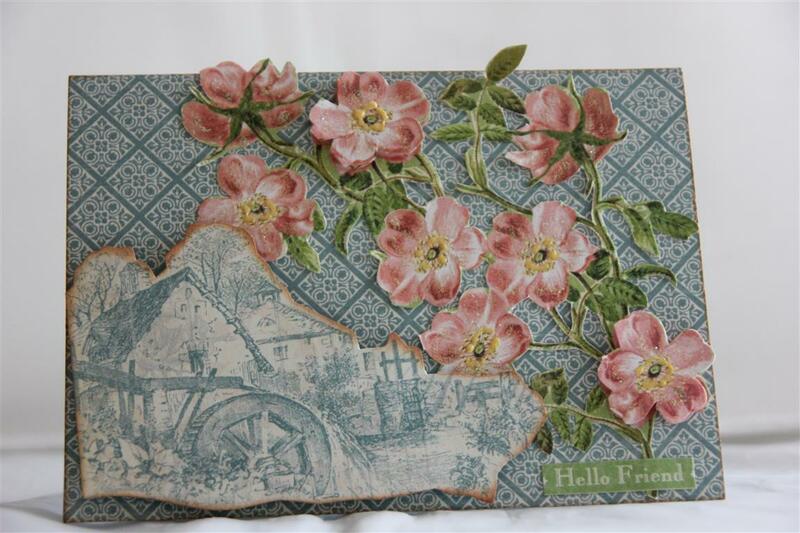 This is the last in my Kaisercraft Porcelain Rose series – I am sure I must have used all this paper!! This card uses paper from the 6″ pad, and a couple of the collectables from the same range. I tied a few flowers together with ribbon to form a bunch of flowers and attached a charm to finish. Family day today so I haven’t been in the craft room, but I am heading there as soon as I have cooked some dinhner! 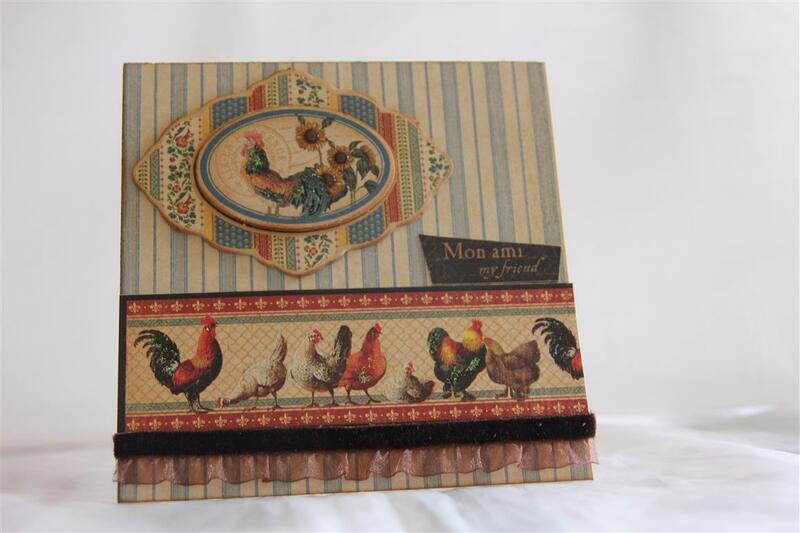 Til tomorrow…..
We havent finished with the true romance cards , but we will get back to them – Today I ran a class using Graphic 45 French Country papers, and I had forgotten how much I liked this collection of papers, so i couldn’t resist making some for myself ! For this card, I covered the whole base card with paper, and ran a strip of border paper across the bottom. The sentiment is cut out of some more of the paper, and I used a matching chipboard for the focal point. I have a huge bag of new papers here at my feet, and I can’t wait to have a good look at it all, so Til tomorrow….